Atari has revealed the long-awaited return of RollerCoaster Tycoon to the PC as RollerCoaster Tycoon World. The publisher said the new game will bring a number of enhancements to the series that weren't possible in previous editions, including cooperative theme park management for up to four players. RollerCoaster Tycoon World won't stray too far from the familiar theme park management formula, according to an IGN report, but it will be "the most connected Tycoon title yet." To that end, developer Pipeworks said players will be able to visit other player-created parks from around the world, share rollercoaster blueprints and operate massive mega-parks in teams of up to four players. "Many of the new features in RollerCoaster Tycoon World were not possible a few years ago, but we have taken advantage of technological improvements to offer a wildly fun gaming experience that stays true to the storied franchise," Atari CEO Fred Chesnais said in a press release. A brief teaser is up at rollercoastertycoon.com and while it's not the most informative thing ever, it does say the game will be ready for launch in early 2015. The Rollercoaster Tycoon Twitter account , meanwhile, tweeted that the new game "will be a full PC experience and will be 'MicroTransaction free'." This is presumably the game Atari was talking about back in March of this year, when it said a new RollerCoaster Tycoon game for the PC was in production. 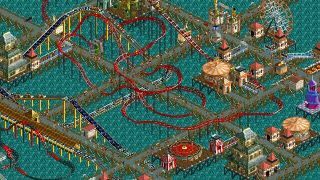 Given what a thundering mess RollerCoaster Tycoon 4 for mobiles turned out to be, it's probably for the best that we're getting something completely new instead of the port we all expected.